In my first post in this series, I looked at the movies Becoming Jane (2007) and Miss Austen Regrets (2008) and began to explore the ways in which these movies are historically accurate. In my second post, I elaborated on the known details of a number of suitors that were attracted to Jane Austen during her life, and discussed the likelihood of Jane having “her very own love story”. In this post, I am examining the likely career prospects that Jane Austen could have had (if she had lived longer) when compared to other female writers of her era. A watercolour painting of Jane Austen, by Cassandra Austen. 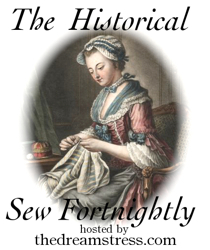 In Regency society, career options for gentlewomen were few. Lower classes of women generally had more options for earning money, but Jane Austen was a member of the gentry, traditionally country landowners. Men and women of the gentry generally lived off the income from their land or investments, and whilst younger sons of the gentry were required to have a career to supplement their income, the women were not expected to work for money. However, upon marriage any property would generally transfer to the husband. Married women could still keep property or funds given to them in a trust or specifically for their own use, but they needed their husband’s consent to dispose of it. Often the fathers of these women would work into a marriage agreement that the woman’s inherited property was for her use alone, limiting the husband’s automatic rights to ownership. However, a married woman (by law) did not have exclusive rights to her own wages, that is if she was in a position to earn any. Rather than being concerned with earning money, women of the gentry generally did other things with their time. They ran their household, cared for the poor or sick living within their area, completed handiwork such as embroidery, and developed their musical accomplishments. There were women who sought more active employment within their sphere of influence, such as Jane Austen’s friend, Mrs Lefroy, who taught the local poor children to read. Many women of both the eighteenth century and Regency periods expressed concern that there was not adequate education for girls and women. I have also read the personal accounts of women who frequently felt disempowered to make any real difference in the world because they lacked the opportunities to do so. However, women of the gentry during the eighteenth century and Regency times did not view careers for earning money in the same way it is viewed today, that is, as a way of becoming financially independent and of developing a sense of self outside of domestic duties. Jane Austen is represented in both Becoming Jane and Miss Austen Regrets as being quite concerned with poverty and her family’s lack of money, even to the point that she feels pressure to provide for them. She is also portrayed as having a strong desire to cultivate a career for herself. When the historical background of the Regency era is taken into account, as well as the voice of Jane in her own letters, I have wondered if the modern representations of Jane Austen in movies are at odds with this evidence. Would Jane have felt pressure to provide for her mother and sister? As the youngest child of eight, and a daughter, it is unlikely that Jane should have been expected to provide for her mother and sister after her father’s death. After Mr Austen died, the Austen brothers rallied together to help their mother and unmarried sisters with a supplemented income. The brothers managed to increase the income from 210 pounds to 460 pounds a year. Whilst this was still a smaller income than the women were used to, and it required them to move from Bath to cheaper lodgings in Southhampton, it was still enough for them to keep a servant. Did Jane Austen want to be famous? Early in her life, Jane appears to have written for the enjoyment of herself, her family and her closest friends. Her first attempts at publication were at the encouragement of her father, and she remained quite obsessive in her secrecy about her writing throughout her life. She published her books anonymously (which was common for women authors of this period), instead attributing the authorship to “A Lady”, and some of her own nieces and nephews were unaware of the true author when her first books were published. Once her brother Henry dropped the secret and her name became more widely known, she still persisted in her reluctance to attend functions where she might meet other influential literary people. She seemed to consistently deny all appearances of fame that people tried to put upon her, even refusing an invitation to a party to meet the famous authoress, Madame Germaine Da Stael. From these instances, as well as her own letters, she did not seem to write particularly to achieve fame. Could Jane Austen have made her fortune in the career of an authoress? 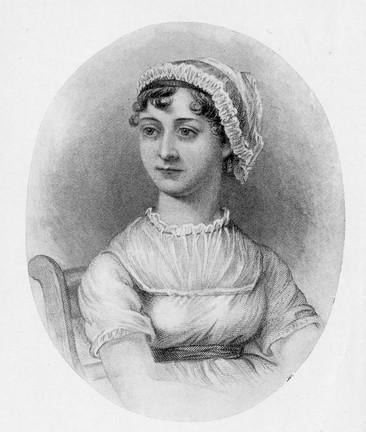 Jane Austen made 140 pounds from the publication of her first novel, Sense and Sensibility, and her total earnings from her writing was 684 pounds at the end of her life. Whilst her six novels were all published within seven years (1811-1818), most of them had been started much earlier in her life and had undergone a long process of revision. Even if she had continued to write a novel every year from then onwards, she would have struggled to produce a very large fortune by her pen. Looking at other female authors of the time, monetary compensation for a writing career was generally low when you consider what sort of income a member of the gentry considered appropriate to live on. In addition, both male and female writers usually did not merely live by the income made from writing novels. They often had other forms of income in the form of royal pensions, earnings from investments or estates, or other forms of writing such as literary reviews or submissions to journals or magazines. 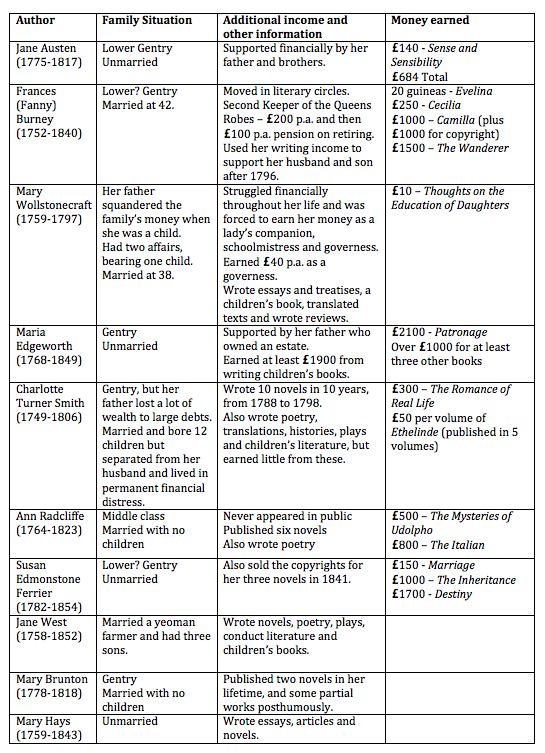 At this point, it is interesting to examine the careers of other female authors during the time of Austen, compiled in the table below. I have only included women writers who wrote in the fiction genre (the newly emerging novel form), as Jane Austen did. There were, of course, other women during this era who were influential in writing other forms of material, such as educational pamphlets and conduct literature. Copyright: Tea in a Teacup. Disclaimer: This information was compiled using limited web-based research. As there is often not enough available information on the particular earnings of authors, I have included as much information regarding earnings as I could accurately discover. Any inaccuracies will be amended once discovered. By this rather brief and simplistic comparison, one could conclude that Jane Austen was underpaid when compared to several of her contemporaries. It has been suggested by others that, by leaving the financial negotiations to her father and brother, she may have unwittingly limited her income because they were unskilled at such negotiations. It is unclear how she could have combated this though, as Charlotte Turner Smith managed all her own negotiations with her publishers and still struggled to enhance her financial position. One significant difference between Jane Austen and other women writers of her time is that most of the other women actively sought patronage from notable peers known to them or their families, sometimes even asking permission for their works to be dedicated to them. Most of the women listed in the table also moved actively in literary circles, often getting to know other famous authors such as Dr Samuel Johnson, Sir Walter Scott, and Hester Thrale, and other female authors. Whilst Jane Austen was not interested in actively promoting herself in literary circles, she did manage to attract the patronage of the Prince Regent who offered her “permission to ask for permission” to dedicate Emma to him, which she seemed to do fairly reluctantly and only after advice from her family. Even if Jane Austen could have managed to overcome some of these differences, it is probably still inaccurate to say that she could have made her fortune by writing novels. Whilst she had several unfinished manuscripts in progress when she died (The Watsons and Sanditon) as well as an unpublished epistolary novel (Lady Susan), she still may not have been able to produce a novel every year, especially considering her previous propensity to spend much time revising and perfecting her work. This natural restriction of time frame would – itself – have limited her income. In order to live comfortably as an English gentleman or lady, it was desirable to have at least 300 pounds per annum for each individual within the family unit, equating to roughly the annual interest on 6,000 pounds. Unless Jane Austen could save that amount for herself (as well as for her mother and sister), there would have been little hope that she could have lived in such a comfortable situation once she eventually stopped writing later in life. Indeed, many of the women who, by necessity, had lived solely on the proceeds from their writing ended their lives in poverty as their writing income dried up. So, whilst Jane Austen would have certainly made more money from writing more novels if she had lived longer, and she could well have been able to better negotiate her earnings with her publishers, seek out some form of patronage and promote herself in literary circles, it still seems unlikely that she could have lived a comfortable life as a member of the gentry purely on the earnings of writing her novels. Was Jane Austen a meek and mild, content-to-be-at-home, aunt? I have read criticism of the popular conception of “Aunt Jane” as a “meek and mild”, family-focused woman who refrained from devoting herself fully to her writing in favour of availing herself to her nieces, nephews, and other family members. Certainly, from reading her letters I never had this impression of her! The Victorian version of Cassandra’s portrait of her sister Jane, published in James Austen-Leigh’s Memoirs (1869). It appears that this picture of Jane Austen could have come from her portrayal to the public during the Victorian era, probably because Austen’s Victorian relations wanted their “dear Aunt” to appear as their version of a “proper” woman, or a woman that deserved their Victorian esteem. In this way, the Victorian perspective of Jane Austen may not be accurate. However, it is just as dangerous for us – as people wedged firmly in the 21st Century – that we not assume that Jane was just like us! That she wanted to have a career because she wanted to be independent. Or that she wanted to fall in love and elope. Or even that she held feminist ideals before her time. If we do this, we could be accused of painting that same sort of inaccurate picture that we accuse the Victorians of doing! That is, painting a picture of Jane Austen that does not accurately represent who she was in the context of the time she lived. 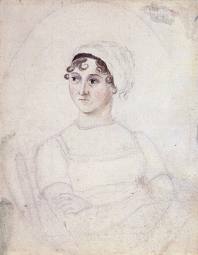 I have come across critics who discuss [Jane Austen] and her view of life and character as if they were those of a contemporary of their own. The result is a portrait comically misleading. For, as we should have learned both from social historians and common observation, we are all largely the creatures of the world we happen to have been born into and our outlook is conditioned by its assumptions and beliefs and conventions and customs. In summary, whilst I enjoy movies depicting Jane Austen’s life, I do find it problematic when they are not historically accurate. Sometimes modern movies tend embellish these historical characters with values that we – as modern men and women – think are important, particularly in the area of the rights of women. In essence, these movies could sometimes say more about our own 21st Century ideals than they say about the reality of Jane Austen, her perspective and her life.